San Francisco, CA — San Francisco Public Defender Jeff Adachi will address a national audience of defense attorneys and leaders in criminal justice reform this Thursday, July 26, sharing his office’s success in raising the standards for quality defense. Adachi will provide the opening presentation, “Expanding the Right to Counsel,” at the National Association of Criminal Defense Lawyers (NACDL) 11th Annual State Criminal Justice Network Conference, held Thursday and Friday at The Westin St. Francis in San Francisco. The conference is part of NACDL’s 55th Annual Meeting and Seminar, the largest gathering of criminal defense attorneys in the U.S. The conference’s theme is Gideon and Beyond: Securing Constitutional Rights Through Policy Advocacy. Adachi’s panel begins at 10:05 a.m. and will also feature Cathy Ansheles, executive director; New Mexico Association of Criminal Defense Lawyers. The conference includes members of legislative committees, lobbyists and reformers working to promote criminal justice reform in their state legislatures. 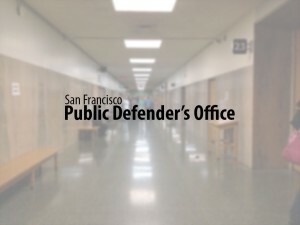 Adachi’s presentation will outline San Francisco public defenders’ steps to demonstrate the value of their work through public awareness, forming liaisons, and creating a system to manage caseloads, measure work and improve the quality of representation. In addition, San Francisco Deputy Public Defender Jacque Wilson will be among the featured speakers at the NACDL Annual Meeting and Seminar on Thursday. Wilson, who is assigned to the Public Defender’s Felony Unit, will address a national audience of criminal defense attorneys on cross-cultural jury selection. Wilson is the founding director of Advocates for Justice, a non-profit organization that fights for social, economic and criminal justice. In 2009, he was honored by the NAACP for his contributions in the area of human and civil rights. He has tried more than 50 cases to verdict ranging from misdemeanor to life cases.